Got this knife a while ago and decided to do a short review on it. - The knife arrived in a Lionsteel branded cardboard box. Out of the box there were a few issues - the action wasn't smooth and it wasn't 100% centered. Lockup was good and so was the sharpness. Also, it seems that the person that sharpened this knife missed a bit and sharpened a part of the recasso as well on one side. 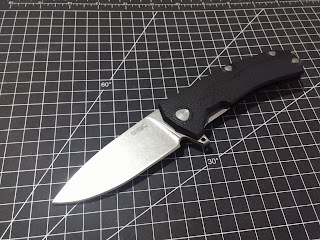 I disassembled the knife, cleaned it on the inside and assembled it again, the centering improved and so did the action. On the clone the torx screws are on the linerlock side and on the original they are on the show side. - The design. This knife has a great design from Molletta, thus has great ergonomics and looks. It is designed as a hard use folder and certainly looks up to the task. - The build. It has very thick 3D shaped G10 scales with nested skeletonized steel liners, thick linerlock and a pretty thick blade, so will definitely could handle hard survival tasks. No blade play whatsoever in any direction. - Opening is quick and easy with the flipper tab. - The details. Here are the real advantages of this knife - rounded ti backspacer, rounded spine, gimping, the lock opening, screws and deep carry reversible wire pocket clip - all of those make this knife unique and very interesting. - Like mentioned before, my knife had an issue where the part of the recasso was sharpened. Not a big issue for a user blade but still a finish problem. - The action. Although it rides on ceramic bearings and the action improved after the cleaning - it still isn't as smooth as some of the other blades I have that run on bearings (doesn't fall shut). - The clip has a bit side-to-side play. - Has original logo and markings. - Overall this isn't a blade to keep on a shelf or in a box with the rest of the collection, this just won't do it justice. It is a blade that is designed and intended to be hard used and abused and I'm sure it will take a licking and keep on ticking. Because of the build and the ergonomics, this knife became my go-to blade for tasks that require use of force and it has performed very well since. Glad to see this review. I just ordered one of these...it's been a week and it still hasn't shipped yet :( We'll see how the QC is on mine when it finally arrives. I got the BGT version if it makes any difference (I don't think so). I'm really new to knife collecting but I've been buying Chinese knives and I'm glad to see that there are lots of Chinese knife enthusiasts out there! My Kur clone in green arrived today and it is really impressive! No problems with blade centering, the action or fit and finish. The detent is firm, but when overcome it guarantees the heavy blade will open and lock up with an awesome "thwack!!". After disengaging the lock the blade falls closed with a few shakes. The clip does move a little side-to-side, but I think that's acceptable to get the deep carry design. This is a really solid knife and I love the modern design that is both functional and pleasing to the eye. What's you impression of the blade steel? I'm sure it's not Sleipner, but how does it perform on the scale of Chinese knife steel? It performs like 9Cr18MoV, which is pretty awesome for the price. Actually the knife is very useful and practical - stout, awesome grind and has great ergos.